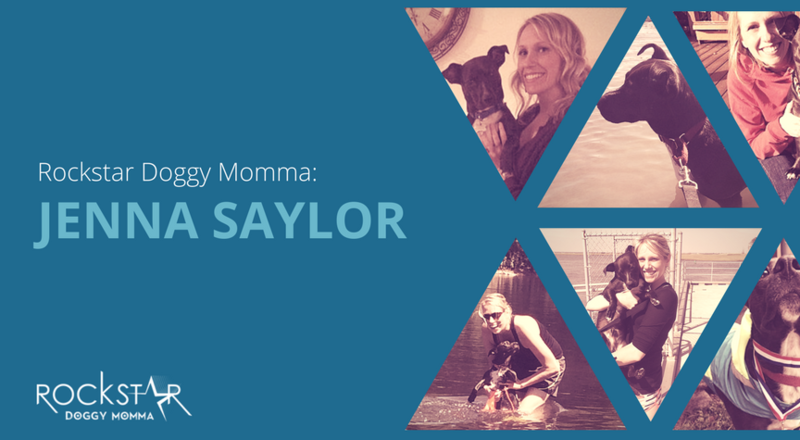 Our latest Rockstar Doggy Momma is Jenna Saylor who’s the mommy of Klein, a pitbull mix. 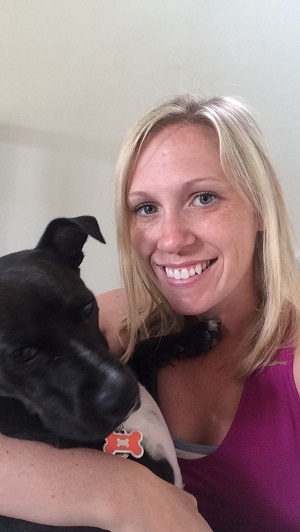 Read how Klein helped Jenna fight alcoholism, and learn about the love Jenna has for her sweet doggy – so inspiring! Tell us the story of how you became a doggy momma! Did something in your life happen that influenced you to get your doggy? My whole life I had an affinity for dogs. After college I volunteered with a few rescue organizations walking dogs and giving them a break from kennel life. The time spent volunteering felt like a respite from everyday life and I felt extremely connected to the universe doing this work. Meanwhile, my full-time job felt less and less like I was fulfilling my purpose in life. In the fall of 2014, I experienced a devastating loss that I was never prepared for or willing to handle. My inability to cope was only exacerbated by the fact that I had a history of reckless partying and an awful track record of regulating real emotions. Unfortunately, the ability to process grief cannot be found in a textbook. Up until this point, my life looked successful and fruitful from the outside. I excelled in my career in social work, I was enrolled in an accelerated graduate program, I started my own business, but inside there was a constant war I tried to deny from a very young age. At this point, I began a vicious cycle of self-destruction. I assured myself I was having fun until there was no denying I wasn’t. I jumped out of my career serving humans, to follow my passion in animal welfare. I worked closely with the animals at the shelter, managing adoptions, fostering when there were no other fosters available, and spearheading their kennel enrichment programs. Alcoholism continued to control my life, causing destruction, sickness, and isolation, even when I was doing what I loved. Over the next week, Ricky and I spent a lot of time together. At work, he followed me around everywhere. While in his suite, he would come to the gate for me, excited for where we might be going. The shelter staff began calling me “mama”, which I quickly shut down. At home, Ricky had this new “calm” about him. There’s a sigh that shelter dogs seem to let out when they are finally content. This sigh simultaneously warmed and broke my heart at the same time. Ricky was finally healed and ready to move on to his next destination. I dialed the number for the rescue to arrange transportation. As the woman answered the phone, fear flushed my body. Fear of the unknown: where would he end up? Would they know and respect the little idiosyncrasies that made this dog who he was? Would he be safe? Would he be abandoned again? This fear turned into the best decision the most indecisive person ever made in her life. 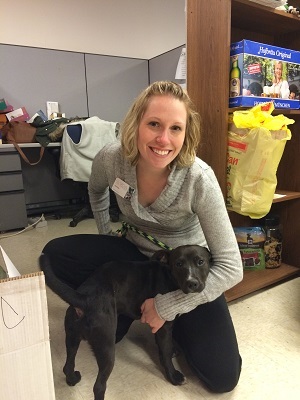 In the most apologetic tone I could muster up, I said “I am sorry for the inconvenience, but I will actually be adopting Ricky myself.” To my surprise, the rescue was beyond ecstatic. On April 1, 2015, I adopted Ricky, my best friend, my confidante, my soulmate, my saving grace. I knew that from this point on, he would be safe, loved, and always wanted. To complete the process, he needed a name. One that tied us together and he could adapt to with his new life. Being full grown, standing maybe two feet tall, weighing 25 lbs, he was definitely a unique pup. Still at the shelter, we googled the word “small” in other languages. We went with a piece of my German heritage and named him Klein. I believe the universe knew I needed Klein. The shame and guilt of addiction magnified by society, the penal system, public policy and often times even your closest connections make you feel completely alone. The consequences of alcoholism and addiction can be incredibly isolating, even after achieving sobriety. No matter what I was facing, I always had Klein in my corner. He challenges me to look at life differently and with him in tow, anything is possible. Although this is focused primarily on my relationship and impact a dog can have on your life/recovery process, an animal, person, life change, job, or object will not get or keep you sober. I did not get sober until 5 months after adopting Klein. Things got much worse before they got better. I owe my sobriety and my ability to be a Rockstar Dog Mom to a 12-step recovery program, professional support, and a support system that rallied around me in many forms. This month I will celebrate 21 months sans alcohol. Dogs make me feel closest to something greater than myself. They truly are the most god-like creatures exemplifying tolerance, selflessness, forgiveness, unconditional love, and kindness. They will forever be a part of my life and my continual recovery process. **Disclaimer: I do not recommend anyone in active addiction or early recovery to adopt a life to care for. In early recovery, short term fosters may be a positive route if you are stable and can provide appropriate care! What is the #1 thing you love about being a doggy momma? Every day I am given the opportunity to be the person my dog believes me to be. I am forever grateful to love and be loved by one living being so much. Those are the things alcoholism tells you that you do not deserve. I adopted Klein to give him the best life. Before I got sober, I was falling short. When I forget either of those things, I am met with forgiveness and unconditional love. I also love seeing him experience new things and simply witnessing the pure joy in his existence. Let’s talk momma/doggy health! What do you do together to stay happy and healthy? Klein is imperative to both my physical and mental health. He challenges me and provides me with comfort to step outside of my comfort zone. He also continually brings me back to many things I had previously enjoyed but lost through depression or alcohol dependency. 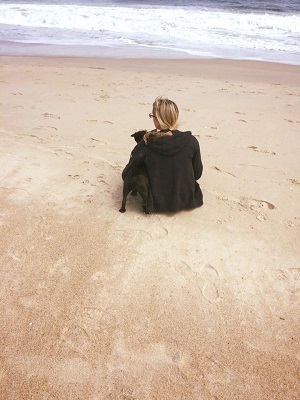 Dogs can teach us a valuable lesson in being present; embracing the world with all of your senses. At home we both have a love of food. When prepping meals, I always set aside Klein friendly meat, veggies, and fruits to be prepared “his way”. As I cook I am forever supervised by the heartbeat at my feet. We also love playing in the snow, finding just the right place to sunbathe, leaf and squirrel chasing, and a good round of the zoomies. Sometimes Klein just helps me to get out of bed and into the world. We always find the best hometown events like food fairs, car shows, and pet focused events. He keeps me socialized with my family, especially his pop-pop, who he proudly has wrapped around his finger. Klein LOVES people his size, so my friends with kids love having our company. He gently and thoroughly cleans their faces, too. (Remember, vicious pitbull). 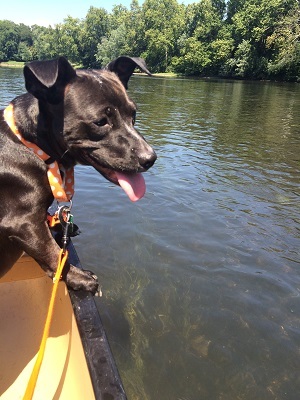 Although the ocean was a little scary at first, Klein loves digging in the sand at the beach, canoeing, swimming in the bay, and playing in nearby creeks. Klein keeps me more active than I’ve ever been. When people ask what I do for exercise, I reply “Anything with dogs”, and they think I’m joking. Most notably Klein and I ran in a 5k with a group of individuals from the recovery community. We used a hands-free leash and he pulled me the whole way, even when I wanted to give up. I seriously hit the jackpot because he can go from couch to 5k any day of the week. Together we try to defy both of our stigmas: pitbulls and alcoholics. Neither of us choose to be anonymous. We share our success stories as often as possible trying to educate people about adoption, misled stereotypes, recovery, and redemption. Each of us is unique, needing to be treated as individuals, which is the premise behind my business A Different Breed Pet Services. 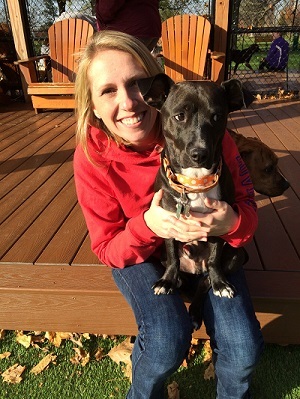 My mission began before Klein, as an alternative to kenneling for shelter graduates or dogs that don’t fit into the tiny percentage of dogs who thrive in a kennel atmosphere. My goal is to keep them at home, making their wait for their owners as routine as possible. Although he wasn’t my muse at the time, Klein validated my efforts. When I briefly worked at a veterinary kennel this year, he came to work with me. Almost immediately, a switch was flipped and he wouldn’t let anyone handle him, not even for walks or food. He reverted back to the scared, unresponsive dog I met in the shelter. This is the experience I hope to prevent for the dogs I so fondly consider to be “A Different Breed”. Klein is a very helpful assistant at A Different Breed. He provides comfort for me in unfamiliar homes while demonstrating and teaching appropriate social skills for my clients. He has also been the best foster big brother to a nearly feral dog, a malnourished puppy, and a pint-sized kitten. What is the biggest gift you have experienced being a doggy momma? Two priceless gifts: That without fault, as soon as he spies my eyes opening in the morning, I am greeted with a paw on either side of my head, a momentary gaze of complete admiration, and a thorough and dutiful face, nose, and ear cleaning. (We struggle with boundaries :)) Together before bed each night before he burrows under the covers, we are able to say our prayers for animals in shelters, just like Klein, to feel safe, loved, and wanted. What are your favorite health and/or pet products that you cannot live without? 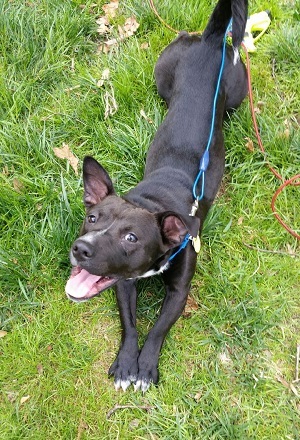 Easy Walk Harness, Zuke’s training treats, and all Kong products (new shelter dog MUST-especially when crate training). Klein suffered from anxious/hoover-like eating so we got him an Outward Hound Slo-Bowl to alter his habits, I choose not to allow him off lead so our 20 and 30-foot leashes are imperative for all of our adventures, I only purchase martingale collars for safety/security. Jenna! Your story touched our hearts. Thank you for sharing it with the Rockstar Doggy Momma community! Beautiful, strength and soul shaping story. Congratulations to all you have accomplished in your life. Most people, without addiction, have not discovered who they are or their path the way you and Klein have. Wishing you both continued success in all you do to help and educate others. Love Biggie and his momma.